← Happy Birthday to Thee! Four vignettes spread over the first act follow racing turtles Bump (Tyler Bond) and Snickers (Brianna Bond) as they inch their way to the finish line in a heart-stopping no-holds-barred thrill ride at 0.02 mph! Who will win bragging rights (and a bowl full of lettuce) and who will just end up with a beak full of dust? In the dog-eat-dog world of the Yard, Toi (Sean Jeralds) runs things with his second in command Charlie (Jeff Whitham) and their enticing personal assistant Fifi (Allie Kate Elliott) under the less than watchful eye of the Man (Ben Frye). But when the Higher Ups send in Buster (Bruce Thomson), the winds of change start blowing and the battle to figure out who is top dog begins! A Woman with Love to Spare (R. White) confides in the audience her fretful tale of taking her “big” boy to the vet. In this “slight comedy about healing weighty wounds,” we see how one woman deals with hearing the “O” word. Newspapers have been destroyed. Potted plants are dead. And when Abby the cat (Marnie Uhl) plans to pin the day’s destruction on Roddie the lovable mutt (Sean Jeralds), Cakky (Carissa Bond), a parrot with a bent wing, hatches a plan to unravel this unusual mystery facing the usual housepets in the Henderson home. Turk (Cason Murphy) is in the midst of a dream come true – running for first place in the 4th Annual Backyard Pet Race! But when din-din comes calling, Turk faces a choice for the ages: a belly full of glory or a belly full of kibble? Callie (Allie Kate Elliott) and Sam (Robert Milligan) are in trouble – the beta fish they shared has gone belly up, and their relationship is following suit. And yet they just can’t seem to flush it. As they try to unravel exactly why their pet passed, Callie and Sam also start to plunge toward some of the deeper questions. In this quartet of “scenelets,” we examine jealousy, joy, love, and loss from four very different perspectives within a “typical” suburban family. During a routine morning at the community dog park, Essie (Marnie Uhl) comforts Vera (Elaine Woods) upon hearing some sad news about Vera’s faithful companion, Buddy. When Suzy (Annabelle Veatch) was little, she prayed for a cat under any condition – even if he became a boy. Now that she’s a teenager, and her cat Norman (Tyler Bond) is too, things are complicated…and Suzy’s suspicious mom (Elaine Woods) is determined to find out what’s going on up in Suzy’s room. Donna (Kate Hawkes) recounts how she has been hearing a dog walking around her apartment – and while she doesn’t own a dog and can’t seem to find what’s making the noise, Donna explains why she isn’t afraid. So, what are you waiting for? 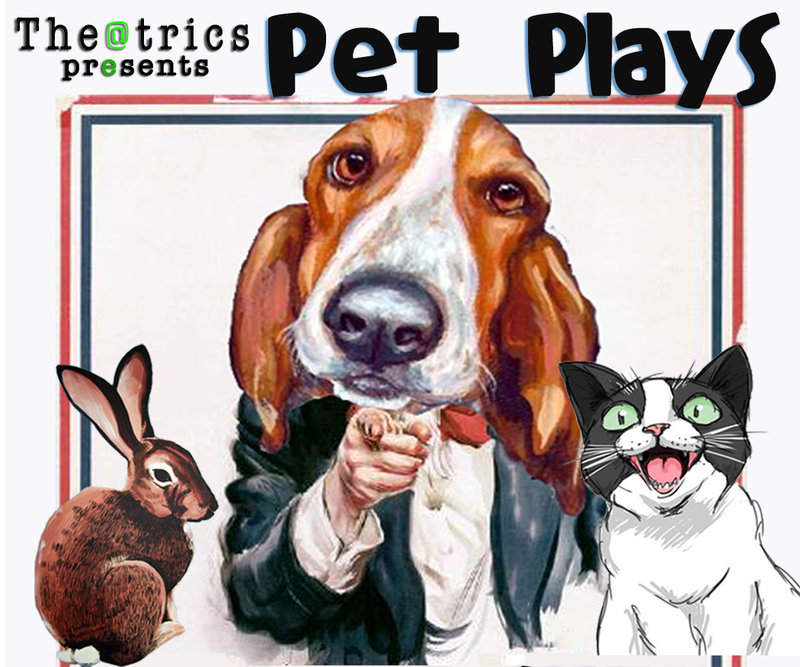 A bird in the hand is better than two in the bush – get your tickets to the Pet Plays Festival HERE, because starting tomorrow night, we are going to laugh ourselves til the cows come home! Proceeds are support all of the fine work that the Yavapai Humane Society is doing on behalf of four-legged, feathered, and fishy friends here in Yavapai County! So, we’ll see you at First Congregational Church (216 East Gurley in Prescott) this weekend…that is, unless you’re a chicken! This entry was posted in Blog and tagged Alex Gabaldon, Annette Lee, Arizona, Arizona's Hometown Radio Group, Charissa Menefee, Emily Pearlman, entertainment, events, First Congregational, Greg Romero, Gurley, Ian Derk, Jen Huszcza, Jennie Webb, John Weagly, Pet Plays, Pet Plays Festival, Prescott, Prescott Valley, The@trics, theater, theatre, theatrics, things to do, things to do in, tickets, Tiffany Antone, what to do in, Yavapai County, Yavapai Humane Society, Zoe Mason. Bookmark the permalink.